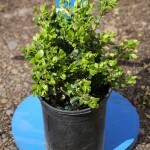 A slow growing compact shrub with small, dark green, glossy leaves. The foliage holds a nice dark green in cold weather. Excellent for use as a low hedge as it responds well to pruning. It grows well in sun to some shade. An evenly moist, well-drained soil is best, but can tolerate some drying out.